Medellin once had a fierce reputation as one of the most dangerous cities in the world, but it’s steadily building a brand new name for itself as one of the leading destinations in the world for tourists, expats, and digital nomads. If you’re wondering where to stay in Medellin, Colombia you need to think about what you want from your trip, so here’s what’s on offer in each of the two best places to stay in Medellin, Colombia. There are lots of safe and fun neighborhoods in Medellin. But most visitors stick to two main areas because of the wide variety of accommodation on offer, as well as their proximity to bars, restaurants, and must-see tourist attractions. El Poblado is the most popular place for visitors to stay, and most tourists begin their trip in this trendy barrio. The area has its own metro station and although it’s a hilly neighborhood it’s perfectly walkable (taxis and Uber are both safe if you don’t fancy tackling the steep incline). Most people choose El Poblado because of its great food and nightlife scene. Parque Lleras is one of the best spots for drinking and dancing in the entire city, and there are countless bars and nightclubs blaring salsa, reggaeton, and EDM into the night air. There are also dozens of upmarket bars, restaurants, and rooftop terraces where you can enjoy global cuisine and delicious cocktails in style. Most hostels and hotels in El Poblado are positioned close to the upmarket Provenza neighborhood, but the entire barrio of El Poblado is safe for tourists. Be aware that the area gets very busy at nights (especially at the weekends) so take care of your belongings and watch your drinks when out and about. Laureles has more of a neighborhood vibe and is relatively chill compared to El Poblado. Situated on the Estadio metro stop, it offers easy access to the rest of the city and the area is completely flat so it’s walkable and cyclable. This area is very popular with expats and long-term visitors because of its relaxed, local vibe, and its safety and accessibility. Laureles has two main parks with plenty of cafes, bars, and restaurants dotted around them, and there are new, cool venues popping up all the time. Eateries range from budget restaurants offering cheap daily menus, cafes, and bakeries offering snacks, to high-end restaurants serving food from all over the world. The best place to party in Laureles is on La 70. This street comes alive after dark and there are plenty of brightly-colored fondas and music bars to choose from. I love that it feels a little more ‘local’ than El Poblado – on La 70 you get to see how the Paisas really party. There are plenty of supermarkets, convenience stores, and ATMs dotted around Laureles, and there’s lots of accommodation on offer for every budget and requirement. Hostels are the best option for accommodation if you’re traveling solo and you want to save money while making lots of new friends. Some hostels are set up purely for partying, but others offer a much more relaxing stay. Here are the best hostels in Medellin. Selina is one of the biggest and best hostels in El Poblado and offers the perfect work hard/play hard combination. The ultra-cool coworking space is available for $10 per day and offers all the free coffee you need to get productive. The downstairs bar is a party hotspot in El Poblado and there’s often live music and DJs playing until the early hours. The hostel itself offers everything from luxury private rooms to clean and functional 20-bed dorm rooms, and there are lots of events on offer so it’s easy to meet people and make friends. There’s also a spacious kitchen and also a cozy movie room on site. The location in central Provenza is perfect and there are lots of grocery stores within walking distance. If you want a little bit of luxury on a hostel budget, check out Los Patios. This boutique hostel offers en suite private rooms and luxurious dorm rooms, and each floor is beautifully themed around Colombia’s different regions. The rooftop bar offers spectacular views across El Poblado and has a cool and sociable atmosphere. Even the kitchen is boutique, and foodies will love the organic herb-garden that guests are welcome to take from. Los Patios is five minutes away from Parque Llleras so is the perfect base if you’re visiting Medellin to do some partying. Tucked away in the trendy area of Mania in El Poblado is Purple Monkey Hostel. This party hostel is aimed at a younger crowd and doesn’t offer much luxury, but if you’re looking for a wild weekend this may be the place for you. Dorm rooms are clean and functional, and there’s a terrace and a games room which is perfect for meeting new drinking buddies from all over the world. A breakfast buffet is included in the price and there are lots of budget restaurants nearby if you’re on a tight budget. Hostal Medellin is the perfect place to come home to after a long day of tourism. Located just 100 meters from Estadio metro station in Laureles, the location is a great central base for your trip to the city. This is by no means a party hostel and is more of a haven of tranquility. Swinging in one of the hammocks in the garden is dreamy, and you can borrow a book from the on-site library or cook dinner on the BBQ. There’s also a bar if you want to enjoy a cocktail in the sunshine, and La 70 is nearby if you want to head out to test your salsa skills. There are private rooms and dorms available and some have desks if you need to get work done while you’re away. If you’re looking to socialize, Backpackers Inn is one of the best options in Laureles. The friendly staff make this hostel feel more like a home, and from my experience, it’s a tough place to leave. There’s definitely a party vibe to this hostel, and the courtyard and games room are the perfect places to meet your dorm-mates, play darts, and pre-drink before heading out to La 70. There’s a communal kitchen which is well-stocked and kept nice and clean, and the private and shared rooms themselves are comfortable and great value for money. Each room has a patio too, which is a nice touch. If hostels aren’t your thing but you want to keep things cheap, there are countless budget hotels in Medellin. Some of them really are a case of you getting what you’ve paid for, but there are a couple that offer excellent value for money. Here are the best hotels in Medellin if you’re on a budget. El Jardín is the perfect tranquil hideaway in hectic Medellin. The beautiful garden and lounge transport you to a million miles away from El Poblado when in reality you’re just a six-minute walk to Parque Lleras. Rooms are a mixture of shared and private accommodation, with shared and private bathrooms, and all of them are spacious, light, and airy. Friendly staff are on hand 24 hours per day, should you need any tips on what to do in Medellin. An American breakfast is served every morning and there’s a laundry service on request. Akapacha is a warm and welcoming budget accommodation option that actually feels more like a house, thanks to the owner’s warm welcome. Natalia is so welcoming in fact, that she invites all her guests to share a meal with her at the weekend, making this a great accommodation option for solo travelers and families looking to connect with others. Rooms vary from singles and doubles to small dormitories, and each room is peaceful and quiet. The kitchen is very well stocked and there’s also a lounge to relax in and watch Netflix. The location is just five minutes from Floresta metro station and the neighborhood is safe, beautiful, and a great place for a relaxing stroll. If you want to spend a little more and enjoy a spot of luxury without breaking the bank, Medellin has a great selection of boutique hotels. If you’re looking for this type of accommodation, these are my favorite boutique hotels in Medellin. If you want access to everything El Poblado has to offer but you prefer to be in a more peaceful area, La Campana is a great option. The residential area that it’s situated in offers the tranquility needed for a good night’s sleep, but it’s still only a short walk to the metro, restaurants, and bars. The rooms are beautifully decorated with Colombian artwork and each room has a private bathroom with marble features and a hairdryer. There’s also cable TV and a space to work in each room. The onsite restaurant serves traditional food from the Aburrà Valley, and you can order room service if you prefer a quiet night in. 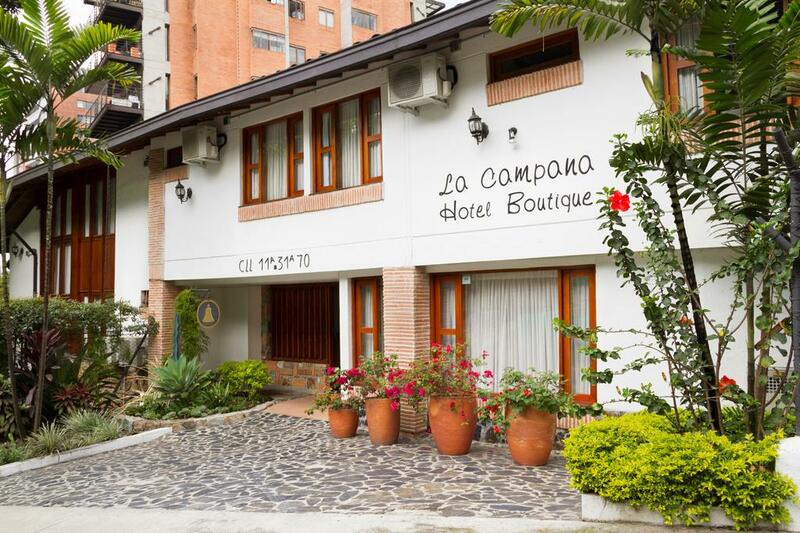 This boutique hotel in El Poblado is one of the most popular options, and with good reason. Rooms are modern and stylish, and are equipped with air conditioning, plasma TVs, and work desks. Some rooms also have spa tubs for an extra touch of luxury, and the garden is the perfect place to relax in the sunshine. Breakfast is included in the price, and can be had as room service if you want to eat it in bed. There’s also free parking available if you need it. Staff are friendly and helpful, and the location is the perfect balance of tranquility and proximity to all the action. Medellin has a surprising amount of luxury accommodation options, and there seem to be new hotels and apartments opening up every week. If only the best will do, here are the best luxury hotels in Medellin. Hotel Poblado Plaza offers world-class sophisticated luxury and is one of the best hotels in Poblado (if not the entire city). Rooms are neutrally decorated in a timelessly elegant way and are equipped with air conditioning and cable TV. There’s a state of the art gym and Turkish bath on site, too, to help you burn off all the tasty Colombian food you’ll no doubt be sampling. Speaking of which: there’s a daily breakfast buffet available, and the restaurant and cafe serve regional food and classic cocktails throughout the day. The location is central enough to get the most out of everything El Poblado has to offer, but without being too noisy. Staff are multi-lingual and are happy to help you plan trips or book restaurants. If you’d prefer an apartment to a hotel room, Luxury Loft Picasso is a great option. Located just eight minutes from Parque Lleras, the apartment consists of a bedroom, a kitchen, and a bathroom. There’s a desk for work and a flatscreen TV so you can combine work and rest in this perfect holiday hideaway. The owners of this apartment put their guests first and they offer outstanding hospitality. They can arrange private transportation to and from the airport, and will happily help you arrange tours of the city’s most famous sites. They can also arrange romantic massages and dinners in the apartment, making it a great apartment in Medellin for couples. For a luxury hotel close to Laureles’ La 70, Obo Hotel is my favorite. It offers great value for money and the staff are superb. Each room has a big, comfortable bed, and a private bathroom with a hairdryer and toiletries. There’s also a flatscreen TV for quiet nights in with Netflix if you’re tired after a long day of sightseeing. There’s a restaurant at the hotel serving tasty food, and there’s also a hot tub and sauna which are the perfect places to soothe your Aguardiente hangover away. Marriott hotels have a good reputation all over the world, but I really love this one in El Poblado. It’s relatively new and the location is in a quieter part of El Poblado so it’s better suited to people who want to relax while still being in close proximity to restaurants and nightlife. Rooms are ultra-modern and luxurious, and decor is beautiful. This luxury carries through to the rest of the hotel and the outdoor swimming pool is a fabulous added extra. There’s also a gym on site if you like to stay fit as you travel. The restaurant serves delicious bar-style food from all over the world, and it’s a great place to hang out and enjoy a drink after a long day in the city. Or you can be lazy like I tend to be and just order room service! I love Medellin. For me, it’s the perfect city for a short break, a vacation, or even to live in. The year-round sunny climate makes it the perfect place to escape winters, and its proximity to nature is a great benefit to this city (the beach is only an hour flight away). Despite its dangerous reputation, the city is now relatively safe and the Paisa people that call Medellin home couldn’t be more friendly or welcoming to outsiders. I hope this post has helped you to find the best place to stay during your trip to Medellin. Wherever you choose to stay, I guarantee you won’t want to leave what is one of my most favorite cities in the entire world. Author Bio: Sophie is a freelance writer from the north of England. She has been traveling and working in Latin America since August 2017 and is currently living in Medellin, Colombia. When she’s not working you’ll find her writing for her blog, Table for One, where she talks about what it’s really like to travel the world as a solo woman.